Touch Blue went through many revisions. It took me quite awhile to find the story I truly wanted to tell in this book. One big change the book went through was that when I first wrote Touch Blue, Tess didn't want Aaron to come. She resented that Dad was excited a boy was coming and that her family had to change. That might be an understandable reaction for Tess, but I kept getting feedback from my critique partners saying they felt so badly for Aaron that they didn't like Tess. I tried giving her bigger reasons why she would feel that way, and I backed up the story so the reader got to know Tess first. But the bottom line was that I had given Aaron a more sympathetic story, which is very hard to overcome. A reader needs to identify with the main character, more than the other characters. One day I asked myself, "What if Tess wanted Aaron?" It made all the difference. I don't save many of my drafts, but here was an earlier opening. Touch blue and your wish will come true. At low tide, I find them. They’re never anything ordinary, like a snarl of rope, a broken lobster trap, or a long, frilly ribbon of kelp. Those things wash up in front of our house almost every day—as common as if they belonged between the huge, black-soaked rocks. No, the sea’s true secrets are always surprises. Yesterday I found an iron teakettle, dotted with barnacles. On Wednesday I uncovered a little wooden jewelry box, empty except for two snails. Today it’s a round bit of sea glass, just the bottom of a bottle. "Thank you," I always say, because sometimes you don’t know for sure if something’s important or trash when it first comes. Across the bay the ferry looks small as a toy, leaving the mainland wharf. I’ve seen that boat heading for our island hundreds of times, but never with my heart pounding so hard. When Rules won its Newbery Honor, I made my editor promise that she wouldn't go easier on me because of that award. As you can see from this photo of one of my revision pages, she kept that promise! And I love her for it. StorySleuths Tip # 102: Be willing to experiment with character motivation to ensure that reader's can identify with the main character. As you know I read and write both fiction and nonfiction. I love a great story, but I also enjoy feeding my brain with facts about a previously unfamiliar topic. One of the best experiences of all is when the worlds of fiction and nonfiction come together, and upon reading a terrific novel I find both my fiction and my nonfiction brain sated by the experience. This is how I felt when reading Cynthia Lord’s wonderful book, Touch Blue. You might learn a ton of stuff from such a well researched piece of fiction – but the primary “job” of the piece will be to tell a great story. The facts will just add extra spice to a really good exciting story. Wow! In just a few pages I have finally come to understand why I always see cormorants hanging out by the Arboretum off the 520 bridge with their wings spread wide. I learned that the lobster’s back is called a carapace, and I understand how a lobster trap works. What Lord has done so well is to insert these tidbits in a way that is completely inconspicuous—she has made them part of the story. Kids who are fact-hounds will eat this stuff up. Kids who are just in it for the story will come away with a knowledge they didn’t have to work for. There is a saying that “Everyday’s a school day.” As authors if we can expand a kids knowledge of the world by tucking interesting facts into a piece of fiction, we should go for it! StorySleuth’s Tip #101: Go for the “extra spice”. Add nonfiction elements to your story, but be sure to do so in a way that doesn’t make the reader feel they’re being buried beneath a pile of facts. I’m so glad you brought up the connection between subplot and theme. I had the opportunity to hear Cynthia Lord speak about theme a few years ago at the Western Washington SCBWI Conference, and I have often referenced my notes from her session when I need to work on theme. She also explained that while themes may arise in a first draft, she doesn’t focus on them until subsequent drafts. Then, she looks for ways to enhance theme, which ultimately enriches the reading experience. What process does she use to develop theme? First, she defines the subjects of her novel. Each story can have a variety of subjects. Some of the subjects of Touch Blue are friendship, belonging, luck, community, and family. These are the “big picture concerns” of the story, and in her SCBWI presentation, Lord urged writers to take the time to dig deep past the obvious possible subjects to unearth possibly more interesting subjects as well. · You can never get away. One prime example of the shadow side is when the postmaster ask Aaron where he’s from, and Aaron hesitates before answering, “You mean right before here?” (p. 37). In her SCBWI presentation, Lord described how writers embed theme not only in plot but in character as well. As you noted, Allyson, in your discussion of subplots, Tess is the insider and Aaron is the outsider. Their interactions and experiences play off each other, providing readers with multiple views of the issue of belonging. 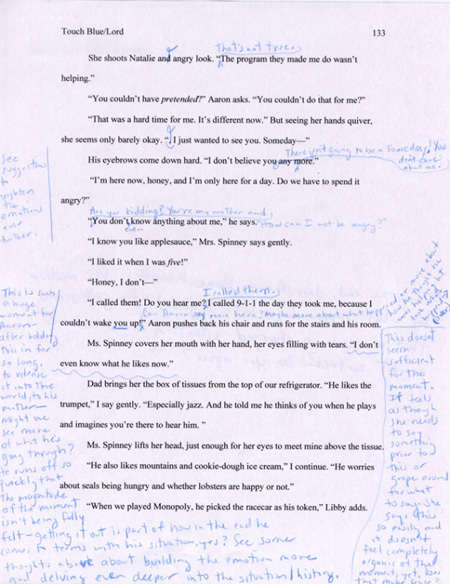 The other way writers can deepen theme, according to Lord, is by using setting and objects. The island community of Bethsaida provides a perfect microcosm for exploring theme. There are tourists and year-round families, long-simmering rivalries and an influx of newcomers. Music provides another example of belonging. Aaron experiences acceptance through his music. When he plays at the Fourth of July picnic, he connects with the islanders. Unfortunately, the cruel note (“Go home! Oops, you can’t. Right, orphan?”) that he finds inside his music book also reminds him that he doesn’t belong. Theme truly deepens a reader’s experience with a book, but it often seems a bit daunting when starting on a project. I really appreciated learning Lord’s process for developing theme through the revision process. Touch Blue provides a great resource for exploring aspects of subject and theme. StorySleuths Tip #100: In revision, develop theme by exploring a question about one of your books subjects. Don’t forget to consider the shadow side of your theme. Plot, character, setting, and objects all provide opportunities to deepen theme. I loved your post on BIG scenes. While I’ve found them challenging to write, I’ve never considered them as something requiring their own special attention. Thanks for the enlightenment! And speaking of enlightenment, I attended a terrific lecture last week at the Seattle SCBWI monthly lecture series that changed the way I think about subplots. The lecture, titled WHILE THE CENTRAL PLOT SIMMERS: SUBPLOTS AND SECONDARY/SUPPORTING CHARACTERS, was delivered by Wayne Ude, author, and MFA program director for the Whidbey Island Writers Association. Using Pride and Prejudice as his example, Wayne pointed out the ways that subplots complement the main plot, serving as a mirror to the primary action and theme. Subplots generally rise out of a novel’s theme. As you create your character analyses, you’ll begin to make connections between characters. You’ll discover the similarities in what they’re going through or have gone through. You’ll see a common element that you wish to write about, and this will be your theme. Your subplots will mirror that theme. Now to tie this subplot discussion into this month’s featured book, Touch Blue. What message do you hope readers will take away after they turn the last page of Touch Blue? Kids today live in all different kinds of families. As Tess says to Aaron, "You can belong in more than one place." I want readers to end Touch Blue with a sense of hope that no matter where you lay your head at night, you always belong to all the people you love and all the people who love you. Belonging and not belonging is a recurrent theme in Lord’s novel. The main plot is Tess’s story. She very much belongs in her tight knit island community, but may lose that connection if her family is forced to move. Aaron’s successful integration into the community is key to Tess achieving her desire—staying put. Aaron’s quest to leave the island is a subplot that mirrors the main plot. He wants to leave Bethsaida and return to his mother. His reason for wishing to leave, the theme of his subplot, is the same as Tess’s reason for wishing to stay on the island—they are each trying desperately to be in the place where they feel they belong. The take away for writers is this: If you find that your subplots feel false, consider whether or not they mirror the book’s main theme. And if you find that you have a terrific plot but no subplots, make them up! But start by asking yourself what situations you could put your secondary characters into that mirror the main characters greatest desire. StorySleuths Tip #99: When writing subplots avoid clunkers by allowing the theme of the subplot to mirror that of the story’s main plot. I’m so happy to be back to StorySleuths after our hiatus this fall. I hope your writing has been going well. This month, we’re reading Touch Blue by Cynthia Lord, which starts when Tess Brooks and her family bring a foster child named Aaron into their home on the island of Bethsaida, Maine. This is a story about belonging, family, community, and luck. Speaking of luck, the timing for me to dig into this month’s book couldn’t be more perfect. 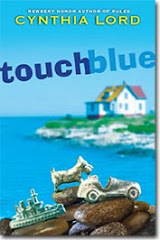 Touch Blue features several “big scenes” similar to the scene I’m currently writing in my novel. What is a big scene? Sandra Scofield, author of The Scene Book, describes big scenes as “scenes that have many characters.” These would include parties, weddings, holidays, and other gatherings. “Never in my life have I written anything more difficult than what I am doing now—trivial dialogue. I have to portray, simultaneously and in the same conversation, five or six characters who speak, several others who are spoken about, the scene, and the whole town… and in the midst of all that, I have to show a man and a woman who are beginning… to fall in love with each other…” (Scofield, p. 156). Scofield says that big scenes take as much planning as “the preparation of a huge Christmas dinner, a school play, or any other event that has many components.” Who is there? Where are they? Why have they gathered? What are they doing? Chapter Two of Touch Blue, Aaron’s arrival on the island, is an ambitious big scene. Let’s step through the scene beat by beat to see how Lord introduces the reader to the characters, the situation, and the island. 1. Libby and Tess arrive at the crowded wharf. a. In a broad stroke, Lord shows us that the entire town is waiting. b. Reaction: Tess is annoyed that Eben Calder is there. We get a quick introduction to the antagonist. 2. While Tess looks through the crowd, she hears snippets of conversation. a. We get details about the boat (setting). b. The unattributed conversation snippets give the impression of the crowd, plus they provide details about what is happening. c. Reaction: Tess reflects on the Hamiltons’ move and its implications. d. Her reflection leads her into a flashback that reveals background information about the plan to bring foster children to the island. 3. Jenna Ross says hi to Tess and they talk. a. We meet a potential new friend for Tess. b. The conversation reveals more details about the foster children. 4. The passengers disembark. Tess waits. She sees Aaron at last. a. Great sensory and setting details emerge from the descriptions of the ferry and passengers (p. 12-13). b. We get a first glimpse of Aaron through Tess. c. Reaction: Tess is disappointed that Aaron has red hair (unlucky) and looks weak. d. Mrs. Coombs’ also comments about Aaron’s appearance. 5. Dad introduces Aaron to Tess and Libby. a. Libby throws herself at Aaron, a direct contrast to Tess’s more restrained approach. b. Aaron’s response reveals his own hesitations. c. Reaction: Tess is worried that this won’t work out. d. More setting details come as the family leaves the wharf, passing a lot full of beater cars. e. The scene ends with another wish from Tess—connection to the theme of luck. The tension in the scene comes from Tess as she moves from a state of excited anticipation to disappointment and worry at Aaron’s appearance. The reader finishes the chapter wondering whether the living arrangements will work out for Aaron and the Brooks. Chapter Two of Touch Blue is a great example of how much a big scene can accomplish. This chapter is nine pages long, and it provides introductions to all the major characters, establishes the setting, connects to several thematic lines (belonging, community, luck), introduces a story layer (Tess becoming friends with Jenna), establishes stakes, and builds tension. While the scene is complicated, Lord keeps it highly focused, never letting us lose sight of Tess’s actions and reactions. Nothing in the scene is superfluous. Everything works together. StorySleuths Tip #98: Sandra Scofield suggests breaking down a big scene into the same elements of a story: beginning-middle-end, with growing tension, a setting, and a shift at the end. Use beats to break the scene down into parts. Make sure that every element contributes something. Congratulations to all the winners of the 2011 Newbery Awards! 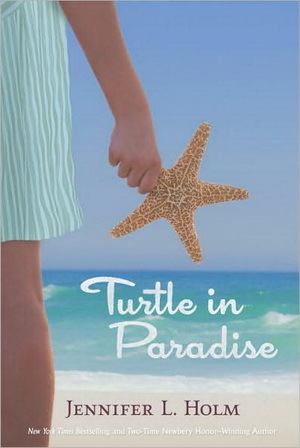 We at StorySleuths were so pleased that two of our 2010 focus books received Newbery Honors: Jennifer Holm's Turtle in Paradise and Rita Williams Garcia's One Crazy Summer. Both books feature fabulous characters, historical settings, and exciting plots. To celebrate the Newbery Honor awards, we have consolidated all of our postings, including author interviews, on both books here. We invite you to read our files for evidence of what makes Turtle in Paradise and One Crazy Summer such distinguished books. Followng the winter holidays we will look for clues about excellent writing in Cynthia Lord's latest, Touch Blue. Vicissitudes - Check out Timekeeper's Moon!